The outer cover is a 32oz/yd2 silicone rubber coated fiberglass. This outer fabric can also be supplied meeting NRC 1.36 specifications for use in nuclear facilities. The insulation layer and outer protection layer also meets MIL-I-24244 specifications. An optional liner of PTFE coated fiberglass fabric provides additional protection of the insulation layer, especially useful if the tape will be removed and re-installed multiple times, or to prevent wear of the needled insulation and reducing the fibers from becoming free in the area of use. 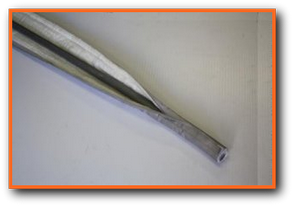 This insulated pipe and hose wrap tape is sewn with high temperature fiberglass thread. 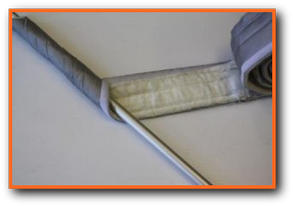 A hook and loop fastener is added on the edges of the tape, allowing for easy closure and removal - allowing for easy inspection of the underlying hose, line or piping. The standard hook and loop is nylon; nomex and stainless steel closure versions are available. May be installed longitudinally or spirally over pipes, hoses, wires and cables. Supplied in 20 foot lengths. May be cut in the field to shorter lengths.